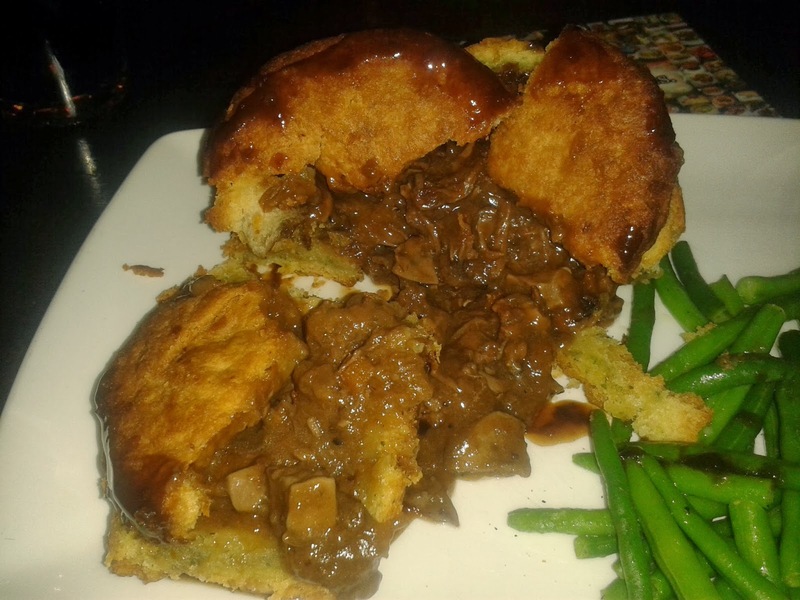 As you are probably aware by now if you’ve read the Open Letter to Nicholson’s Pub, I was unfortunately provided with a Steak and Kidney Pudding last week, even though I did in fact order a Steak and Kidney Pie from their menu. You can also read feedback provided by the pub chain regarding the mistake they made in providing one of the Pierateers a non-pie. 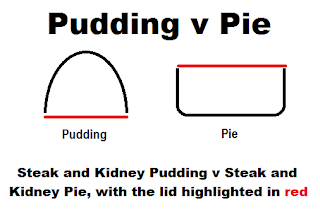 However let me just take a moment to stress that it is not the pudding itself I have the problem with – it’s the mislabelling of a steak and kidney pudding as a pie. At the end of the day, I still ate it and it tasted reasonably good. It’s just that I don’t write for “puddingrate” or any such thing! In fact, there’s nothing wrong with selling horse burgers either – as long as they are labelled as being horse burgers, rather than being sold under the beef burger name. Likewise it must be pointed out that there is nothing wrong with a pudding, as long as it is sold as a pudding and not as a pie. The suet pasty was quite tasty, but a bit thick and thus the filling to pastry ratio was not ideal. There were certainly points where I had far too much pastry in my mouth compared to filling, which is not the ratio it should be. The pieces of steak were quite prominent and I certainly didn’t feel the content was too steak or too kidney focused – it was a very well managed balance of the two. However I would have liked to see a bit more meat in the pie, making it slightly larger to better balance out the filling:pastry ratio. The gravy had a nice consistency to it, not overpowering and not too runny. The condition was reasonably good considering it was a pudding, even when I needed to turn it the right way up to eat it with the lid facing upwards, as you would a pie. The colour was quite good to, with a nice golden shimmer to it. The capacity was quite strong; with fortunately not much padding with other things (there was a slight bit of onion, but not enough to make me think they were trying to overly pad the content and capacity out with non-meat). 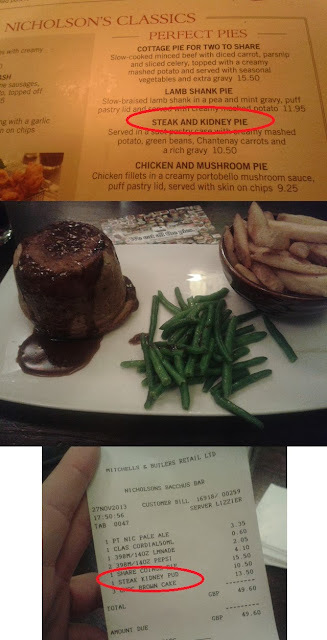 If it had been a pie, I think £10.50 would have been a little bit more expensive than it was worth, but as I was in fact sold something I did not order (and that wasn't even on the menu! ), in my opinion I don't really think I should have been billed anything! Overall, if this were a pie I think it would probably have rated at about the 5.5/7 mark, but as it was not a pie, it won’t be able to go on the Pierate Pie Rankings list. 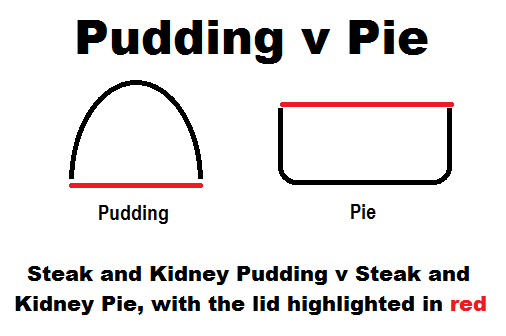 - Ensure you label your food correctly to avoid confusion, particularly between pies and non-pies. - If something on your menu is not correct (printing error etc. ), remember to inform the customer of this before they order (and ideally update the menu as soon as possible with stickers or a reprint). - If you have online menus, you have very little excuse for not updating these almost immediately. - Respond to customer feedback as soon as possible.